Staying in control, in Blue-Black Control that is, all weekend long, Robin Dolar earned his Grand Prix trophy number two, or as the locals say: numero due! 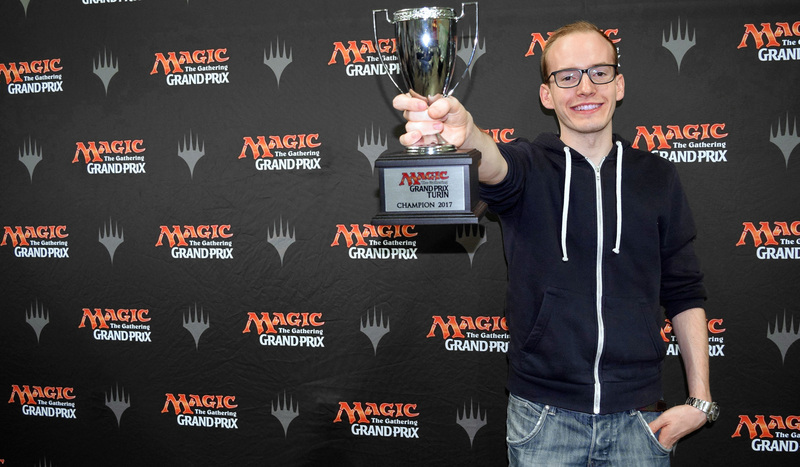 926 players entered this, the final Grand Prix to feature Battle for Zendikar, Oath of the Gatewatch, Shadows over Innistrad, and Eldritch Moon in Standard; 304 returned for the second day; eight sat down for the playoffs; one walked away with the trophy and title: Congratulations to Robin Dolar, champion of Grand Prix Turin 2017! Dolar navigated his Blue-Black Control masterfully throughout a Top 8 which featured at least six distinct archetypes; Temur Energy and the recently rediscovered Vehicles were the only decks to field two entries here. The Standard format was about to rotate, but it showed itself from its best side in Turin! After nine rounds of Standard, the original field of 926 was whittled down to just 304 players. They would return on Sunday for another six rounds followed by the Top 8 playoffs. Leading the charge into the second day were four players at 9-0: Alessandro Aristei, Alain Bardini, Bart van Etten, and Andrea Sonzogni. But fierce competition wasn't far behind. Just among the people who finished the day with a record of 8-1 one could find names like Alessandro Lippi, Pavel Matousek, Dario Parazzoli, Raul Porojan, Loïc Le Briand, and Robin Dolar—and that's just listing those with multiple previous Grand Prix Top 8 finishes. So tune back in tomorrow to watch some of the game's best and brightest play for that coveted Top 8 berth and eventually for the trophy and the title of champion of Grand Prix Turin 2017!